For those who do not have swing dancing classes nearby, swing dance video lessons are a good alternative. Those who do take swing dancing classes can also learn new moves and perfect their style by watching and imitating dance DVDs. Swing dancing is a form of dance that is always lots of fun. Overflowing with energy and featuring upbeat music, most varieties of swing dance are a real treat to learn, practice, and perform. Attending weekend swing dancing events is often one of the most fun types of dancing that dancers do. Because of its relatively quick rhythms, swing can seem difficult to learn before you start with lessons. However, most of the steps are quite simple, and because the steps are heavily tied to the beat of the music, learning the moves is easy once you get a feel for the rhythms and the types of movements. Learning to dance is often best done in a dance studio with a qualified instructor; however, those with a little dance training in another genre, or even those who simply are disciplined enough to learn dances themselves, can just as easily learn from virtual instructors as from an instructor in the studio. Several DVD options exist; in addition, free videos online make teaching yourself even more affordable. Learn to Swing Dance featuring Ginger de Paris: With more than three hours of instruction, this DVD set offers a wealth of information. Swing Dancing for Beginners with Shawn Trautman, one of the leading video dance instructors of the decade. You Can Dance-Swing with Vicki Regan is a good introduction. Simply Swing Dance for Absolute Beginners by Bob Rizzo introduces the very basic movements of swing. In order to get the most out of any of these instructional DVDs, be sure to pause and stop them often, and to watch them actively (standing up) so that you can try out everything that is demonstrated. Watch the DVD over and over again until you have not only the steps, but also the style and rhythm down to a science. 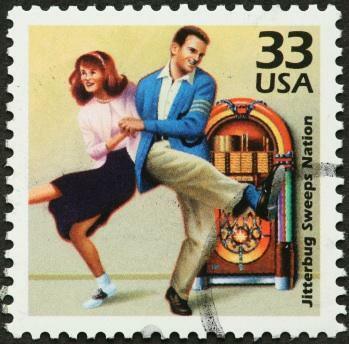 Jitterbug Swing Dance Basics: this video is the first in a series of three, all featuring fun swing dancing moves. While reading swing dance step instructions online is helpful, many dancers prefer the visual aspect of watching videos in order to learn the steps. One of the biggest advantages of learning how to swing dance as compared to other genres of dancing is that practicing simply means going out on a Friday or Saturday night and having a blast with friends and fellow dancers. While beginners may be hesitant to get out on the dance floor and show off their moves, remember that everyone else is having way too much fun dancing to worry about how you look on the dance floor. Laugh a lot and have fun, and the moves will improve slowly but surely.